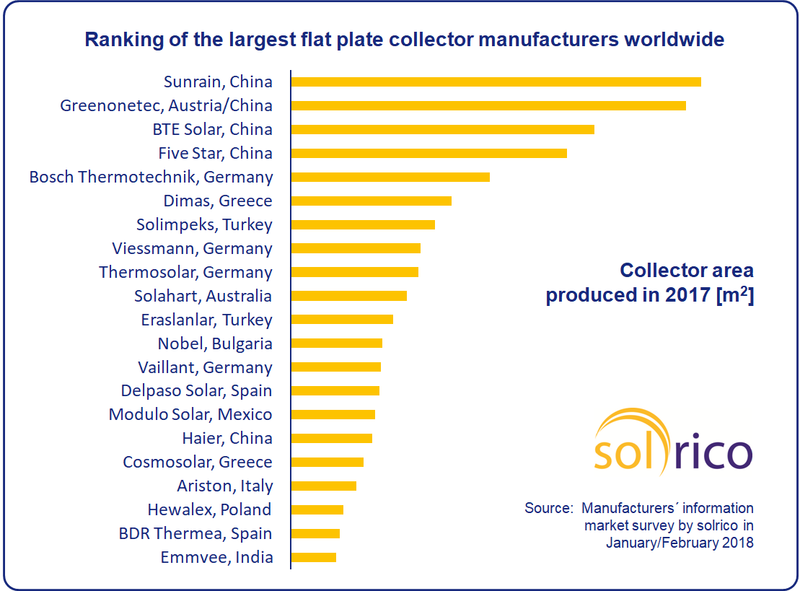 The 2017 ranking of the world’s largest flat plate collector producers clearly shows the market dominance of Chinese companies. Even second-ranked Greenonetec, an Austrian collector manufacturer, is now majority-owned by the Chinese-based Haier Group. The corporation acquired 51 % of the manufacturer’s shares on 18 May 2017. The largest European flat plate collector producer was heating technology supplier Bosch Thermotechnik, although it remained at a certain distance from the top four. Business at Bosch Thermotechnik suffered from declining solar hot water markets in Germany (-16 %) and Brazil (-18 %). Nearly all the companies outside Germany increased production last year. In China, turnover varied significantly between companies. Some experienced strong growth, whereas others registered a downward trend on the market. BTE Solar announced the greatest surge in sales (+133 %), thanks to seriously tested systems produced on its new automated manufacturing line. The manufacturer said that those products “convince customers to return regularly.” Sunrise East Group with its brand Sunrain claimed to have increased flat plate collector output by 44 % in response to heightened solar water heater demand for property developments in southern China. However, the full-year financial results of the business, which is listed on the stock exchange, show a 15 % decline in solar thermal sales in 2017 due to a deep fall in vacuum tube collector sales according to the marketing department. Haier produced 20 % more flat plate collectors last year, also pointing to growing demand on the real estate market. Five Star saw a 13 % reduction in flat plate collector output. The company said that it had expected declining figures, since the entire market had been shrinking. Thermosolar is headquartered in Germany, with a collector factory in Slovakia. Cosmosolar from Greece was listed as having the same production output as in 2015. Technical issues prevented the manufacturer from sending the most recent 2017 figures. Bosch Thermotechnik, headquartered in Germany, owns additional collector production facilities in India, China and Brazil.